Published by Yvette Depaepe in collaboration with Greg Barsh , Head of the Senior Critics. I took this photo on the New York Subway. It is a glance to the other side of the rails.I like the fact that you get a few stories fitting almost perfectly in the frames of this single snaps. I would be happy to hear what you think about it! Are the BW OK? Does the crop/ size - length / width work? Does the image convey the feeling of being in a big city? Are the ISO, shutter speed and aperture OK? Thanks for giving me some feedback to improve this shot. I like the idea behind your image, but I think this photo is a little too busy to me. Not because of all the stories but because of the many beams on the foreground making the composition restless. The biggest one is the most disturbing. My suggestion is to make a crop. But it is important to make the right choice. The first possibility is that you place the biggest beam on a better place by cropping to have it on the right side of the frame. The beam will ask much lesser attention and you still can go for the other stories. The second possibility is to crop along the beam on the left deleting the very first story which is lesser interesting than the last story on the right. For example, you can start cropping the small beam beside the lady who is looking at us. By doing this, the big beam will be situated on a better place in the composition and the image will give the photo a much more restful composition. To me the second possibility is the best: four nice stories and the beam on a better place. The choice for B&W is fine. Thanks Theo. Your inputs are always insightful. This is a really interesting image because of the framing of the people. They fit so nicely into their separate segments, and each story is different. Just as it is in life, we can be sitting right next to another person on a bench, but completely apart from them at the same time. You asked if the image conveys the feeling of the big city. In my opinion . . . . Yes !! Thank you for including the exposure settings. Both f/4 and 1/40 second seem a bit 'risky' - but you got adequate depth of field and no motion blur. A smaller stop and faster shutter would have been insurance. I think the D610 would go easily to ISO 800 with a minimum of noise. I'm not a street photographer, but I think you've got an excellent 'slice-of-life' photo here. You have 9 stories to nudge viewers toward thinking about how we are all gathered together, yet all individuals. The vertical barriers in the composition make a statement about the space between us. You asked also about the black and white conversion and proportions. 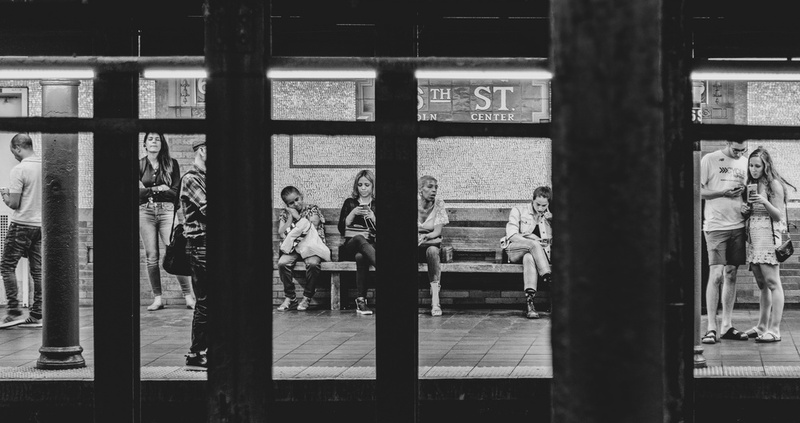 I think the long, narrow format fits the subway scene, and the black and white tones are looking good. The contrast is strong, but I think that harsh look suits the big city theme. This is reality. Thank you for your response and words of encouragement, Steve. I red the information and would like to know from where you took it: on the opposite side rail, in the waiting room or in the train? The light may be very different according from where you took it. 1. Your eye is pretty good to detect something interesting. 2. Your skills to capture such a moment is interesting. 3. You master very well your camera. My personal opinion is that this is an excellent shot. I enjoy 5 different and interesting stories in each frame. I will not elaborate about the stories themselves and leave that part to the imagination of the viewers. The reversion to BW is quite appropriated, no colours disturbing the attention. I wouldn't crop the photo. In my personal opinion, this display is good enough even if it looks a little tight on the left. May be a small black frame on both sides could be interesting. All I want to say is that I like a lot this capture. Thanks a lot for your kind words, Johanes. Love it. Excellent subway capture at 66th and Lincoln. Too bad you didn't have an unobstructed view of the central bench, it's classic and exactly what you see everyday. I'm amazed that you managed this at ISO 200 and 1/40th of a second with decent focus. Must be a very well lit station. That upper level tile on the walls is about 115 years old. I fully agree on reversing it to BW, nothing else would work on this type of shot. I think it's worth trying again, preferable when the platform is busy. Or maybe at some of the Number 1 Line Stations uptown, which have many benches on the platform and no girders in the way. I think the station at 181st near the GWB might work. Although the girders are a nice touch when they fit the shot, if not perfect. Maybe you can find an even better angle to shoot through the gaps? On this particular shot, more ISO would likely not have improved the image, but it would bump up shutter speed and catch anyone moving a bit sharper. Thank you for your knowledgeable insights, MIchael. I agree with most of them. It is clear that you know your way around the Subway. I was just a 1 day visitor. Last I have been there was many years ago. I live in Israel and stayed only a few days in New York so going to the other location is impractical. I'm happy that you like the result I managed to get in this shot. Best regards and keep enjoying your wonderful city. To me, this photo is a wide story of a city in search of excellency which results in lack of happiness . Some are impatient, some are trying to enjoy the moment, some work hard, some are tired, some don't care at all and of course some are keeping a lot of secrets. Having a lot of diversity but a same destiny. I even enjoy the unseen parts of the plot. Especially the sweet story on the right of the big pillar. Life's finest parts are often unseen or deliberately covered asking the viewer to fill it with our creativity or imagination and that's the beauty. I appreciate the moment you captured as it is crowded like everyday. The image is not sharp but that's OK, might be the situation is culprit. I would pumped up the ISO to at least 400 in order to get an higher shutter speed. The reversion to BW is done flawlessly. Thanks for this piece of “capsuled cinema”. Thank for this fine critique, Guy.